a guide to electronic game operation and servicing” by Atari in 1980. 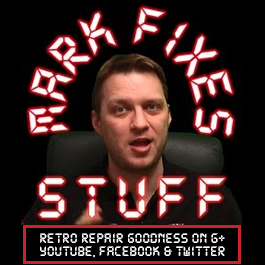 Covering basic topics such as how to solder, use solder wick and what resistors, capacitors, transistors and diodes do, it *THEN* plunges into Arcade controller, PCB and Monitor repair! How times have changed! This book really is a must read, and whilst dated in some sections is really interesting and helpful! Whilst aimed at 1980 arcade machine owners, it is really useful for lots of subsequent home computer technology too! The Book contains seven chapters including approximately 180 pages of heavily illustrated information – geared for the operator and distributor technician who repairs Atari’s electronic video and pinball games. Chapter 1 begins with an introduction to tools and test equipment, and shows soldering techniques in many photographs. Chapter 2 covers game repair how to isolate problems down to the major component level and how to maintain all the major player controls Atari has ever designed. Chapter 3 contains information on how the two major types of monitors function (raster- scan and Quadrascan™ X-Y). It also includes detailed problem/solution tables to aid you in troubleshooting both types of monitors. Chapter 4 explains the functions of various discrete PCB components, such as resistors, capacitors, transistors and diodes. Chapter 5 introduces the reader to integrated circuits. It covers such topics as how to find ICs on a board, and how to count in the binary and hexadecimal number systems. It also includes a table for identifying IC manufacturers’ logos. The last section of The Book — Chapters 6 and 7 — deals with circuitry and analog devices. The Book also contains an eight-page glossary. It concisely defines terms used in electronics, and electrical and mechanical design. Again, I’m not sure of the legal status of distributing this document, but it is not for sale anywhere so I’l take the risk. "The Book" contains seven chapters including approximately 180 pages of heavily illustrated information geared for the operator and distributor technician who repairs Atari's electronic video and pinball games.